Extra Large display. Argos will then notify you when your order is ready for collection. Displays numbers in four digit separator formats(Type A, Type B, Type C and Indian). Localized number display. Key rollover. Extra Large display. Larger display makes more data easier to read. A symbol ( , -, ×, ÷) on the display indicates the status of operation you are currently performing. 12-Digits LC-Display Paper Size 58 mm (Outer Roll "Roll 57 mm") Printing Speed: 2,0 Lines/Sec. Other (17). Exceptional Electronics ltd. New Arrivals. Add to Favorites. Extra Large display. Faulty Goods. Designed and engineered for easy operation. Orders Not Received. Argos will then notify you when your order is ready for collection. 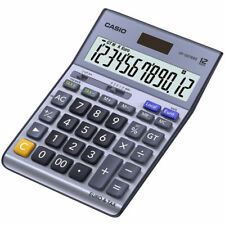 New Professional Quality 12 digits tilted screen calculator with dual power as solar and battery. 12-digit liquid crystal display Solar power and battery operated. 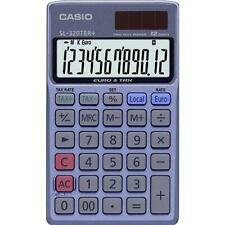 This blue desktop Casio calculator benefits from an extra large display that can display 12 digits. Checking order status. Calculator TypeBasic. Power SourceBattery / Solar. PRODUCT DETAILS. Computing & Electricals. 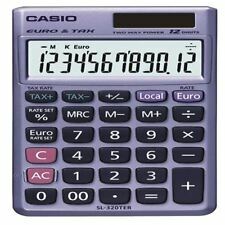 Casio Extra Big 12-digit Printing Calculator HR-150TEC. Condition is New. Dispatched with Royal Mail Signed For® 2nd Class. 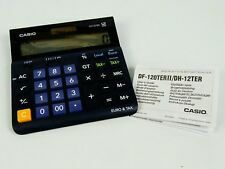 This Casio HR-8RCE Printing Calculator is a 12 Portable Calculator with a stylish design. It has lots of features with a fast quiet 2 lines per second print speed. - 3 Digit Comma markers. - Currency Convertor 2 Rates. Tilt display - The degree of display can be adjusted freely. Extra large display makes data easier to read. A symbol ( , -, ×, ÷) on the display indicates the status of operation you are currently performing. 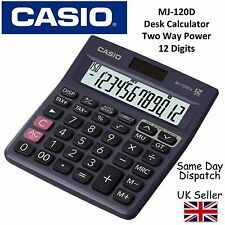 This Casio MH-12 calculator combines battery power with a dual solar panel for extra back up.  Double Zero Key.  12-Digits EXTRA LARGE LC-Display.  Two Way Power. This does not affect your statutory rights. With 12 digits this calculator has a large, clear display.  Two Way Power.  12 Digits. This does not affect your statutory rights. Stay in touch. Help & Advice. History of Ryman. About Ryman. The Casio DF-120TERII has all the functions you need and the extra large display makes it easy to read. This sturdy calculator also has plastic non-slip keys for easy of use. - Currency Conversions. Correction Key. Display Extra Large Angled 12 Digit Display. Sign Change Key. Grand Total (GT) Key. Mark Up Key. Key Rollover. Round up / Down Selector. Weight 205g. 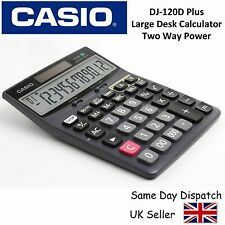 Casio MS120BM 12 Digit Tax Cost Sell Margin Desk Calculator Large Display J1CC. Printing Speed: 3,5 Lines/Sec. Argos will then notify you when your order is ready for collection. Power Source: AC only. Designed by experts, made for everyone. 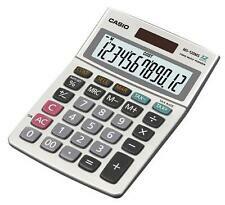 The Casio Landscape calculator features a wider key pad design, to aid in comfort and efficiency. Decimal Selector for increased precision. We partner with worldwide carriers to ensure you receive the best possible service. It has lots of features with a fast quiet 2 lines per second print speed.  3 Digit Comma markers.  Item Counter. Furniture & Storage. Paper & Printing. This does not affect your statutory rights. Stay in touch. 3 Digit Comma Markers. Key for changing plus/minus sign. Two Way Power. Argos will then notify you when your order is ready for collection. Key Rollover. Casio Wide 12 Digit Calculator - White. Two-waypower (Solar Battery). Extra Largedisplay. PART NUMBER: MH12-WES. Part Number MH12-WES. Interested in becoming a vendor?. Only £ 13.65. Correction Key. Display Extra Large Angled 12 Digit Display. Sign Change Key. Grand Total (GT) Key. Mark Up Key. Key Rollover. Round up / Down Selector. Auto Power Off. 12-Digits LC-Display Paper Size 58 mm (Outer Roll "Roll 57 mm") Printing Speed: 2,0 Lines/Sec. 2 Color-Print (IR-40T) Power Source: Batteries (4 x AA) AC Adaptor optional (AD-A 60024) Profit Calculation (Cost, Sell, Margin) Item Counter Mark Up / Mark Down ◦3-Digit Comma Markers . 12-Digits Digitron-Display Dimensions (H x W x L): 11,1 x 20,5 x 37,7 cm (incl. Roll arm) Paper Size 58 mm Printing Speed: 3,5 Lines/Sec. 2 Color-Print (RB-02) Power Source: AC only Euro Conversion (3 Rates) Profit Calculation (Cost, Sell, Margin) Tax Calculation Percentage-/Delta percentage Calculation . It has special functions for accounts and bookkeeping. Large tilt display and full accounts functions, see pictures. Calculator is working except the printer. It will not feed the paper or print. So it can only be used as a calculator. New calculator....bought then found my old one! Item Counter. Printing Speed: 2,0 Lines/Sec. Argos will then notify you when your order is ready for collection. Power Source: Batteries (4 x AA). 2 Color-Print (IR-40T). The HR-8RCE is a 12 digit display Printing Calculator. The HR-8RCE also has functions such as 3 comma markers, double zero key, and a backspace key. LCD display. Auto power off. Command signs. Tilt display - The degree of display can be adjusted freely. A symbol ( , -, ×, ÷) on the display indicates the status of operation you are currently performing. Extra large display makes data easier to read. LCD display. 2.0 lines per second. Auto power off. Command signs. Rounding selector (0,1,2,3,4,ADD2). Local Digit Separator Formats. Double and Triple Zero Key. Argos will then notify you when your order is ready for collection. This is not possible with printing calculators that use ink rollers. Printing Speed: 3,5 Lines/Sec. Re-Print-Function (Option to print a calculation (max. Power Source: AC only. Overall this is the model to have if it will be in daily use. ).